Lions is the largest service club in the world. Members are volunteers who raise funds for local, national and international projects and who carry out local community projects for the elderly, youth, disabled and those in need. ALL funds raised are used for good causes. Lions members make a contribution to an administration fund, but despite this we still need extra funds to run the Club itself. 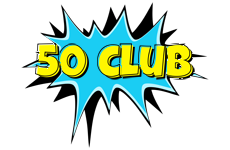 In order to help to do this we run a “50 Club”. We need 50 people prepared to contribute £1 per week, that is £4 per month by Standing Order. In return we will hold a monthly draw with a prize of £50.